This property is directly associated with the early twentieth century developmental era (1920-1930) when a significant number of commercial buildings were constructed and the modern downtown commercial district was fully established. In 1923 Seattle adopted its first ordinance that regulated specific geographic areas for specified uses; it allowed the most densely concentrated commercial development to occur in the downtown core. The economic prosperity of the 1920s stimulated the development of numerous major highrise commercial buildings, as well as smaller-scale bank and commercial buildings, major hotels and apartment hotels, club buildings and entertainment facilities, which were typically designed by leading Seattle architects. During this era, the original residential district was entirely absorbed by commercial and other real estate development. By 1930, virtually all of the old residential properties - as well as many of the immediate post-fire era commercial buildings outside of Pioneer Square - had been demolished or removed. During the late nineteenth century banking enterprises were typically small and housed at the storefront level - often as a prominent corner tenant - of a large commercial business block. As banking businesses were consolidated and grew into larger financial institutions, they began to be housed entirely within smaller business blocks constructed for and owned by the banking enterprise. Individual bank buildings were most often designed in a neoclassical mode conveying stability and permanence and included ornate interior finishes and design features. During the post-fire era and the earliest years of the twentieth century, the headquarters of the major banking enterprises were clustered near First Avenue and Yesler Way or along the southern end of Second Avenue near Yesler Way. However, by 1912 nearly all of the major banks and financial institutions were headquartered at locations along Second Avenue near Marion and Madison Streets. By the mid-1920s, the financial district was well-established at this location as banks and other financial institutions continued to construct or occupy portions of large commercial office buildings as well as smaller scale buildings devoted entirely to banking operations, including; the Scandinavian American Bank (Alaska Building, 1904); Seattle Trust and Savings Bank (1906, 1922); Seattle National Bank (1910, 1921); National Bank of Commerce (Baillargeon Building, remodeled 1918); Union Savings and Trust Co. (Hoge Building, 1911); the Dexter Horton (later Seattle First National Bank) Building (1922); and the Bank of California (1923-24). The Seattle National Bank was organized mainly by Fred Ward and chartered with capital of $250,000 in 1890. Ward became its cashier, G.W.E. Griffiths, president, and William Ballard, vice president. Its board included John Leary, a former mayor of Seattle and one of the city’s leading entrepreneurs, and Judge Thomas Burke, the man most responsible for persuading James J. Hill to terminate his passenger railway line in Seattle, this assuring the city’s future growth. 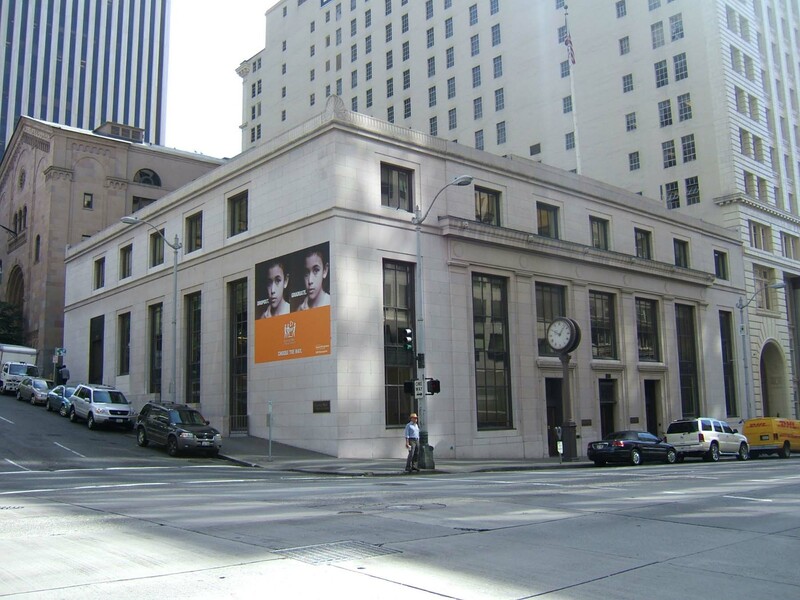 The bank’s original offices were in a small corner room in the Pacific Building at Occidental Avenue and Yesler Way. In 1903, Seattle National merged with the Boston National Bank (chartered in 1889) and moved to that firms’ location at NW corner of Second Avenue and Columbia Street. Seattle National Bank kept its name while tripling its capital stock. Its total deposits exceeded $3 million making it the third largest bank in town, after the Dexter Horton bank and the Puget Sound National Bank. In 1910, Seattle National and Puget Sound National merged, thus eclipsing Dexter Horton Bank. The enlarged Seattle National Bank remained the largest commercial banking institution in Seattle until 1924. In the great merger of 1929, Seattle National, Dexter Horton, and the First National Bank group combined to form Seattle First National Bank, long the principal local bank until it became part of Bank of America. By 1920, Seattle National Bank had outgrown it quarters at and commissioned the Northwest’s premier designer of banking halls, A.E. Doyle, to create an appropriate new building at the SW corner of Second Avenue and Columbia Street. Albert E. Doyle is considered to have been Portland’s most distinguished and prolific architect of the era. He had apprenticed to the Portland firm of Whidden & Lewis and also received training at Columbia University and the office of Henry Bacon, the designer of the Lincoln Memorial. In 1907, Doyle opened his own office in Portland and quickly gained notoriety for the purity of his classically-inspired design work. His design of U.S. National Bank in Portland (1916) was widely acclaimed, after which be gained many other bank design commissions throughout Pacific Northwest. Several other commercial projects in downtown Seattle were also designed in partnership with C.A. Merriam, including: the J.S. Graham Store (Doyle Building, 1919-20); National Bank of Commerce (Baillargeon Building, 1918 remodel), and Seattle Trust and Savings Bank (Pure Fitness, 1922 remodel). In 1969, interior spaces were completely remodeled to accommodate a brokerage firm. Only a small portion of the highly ornate grand banking hall is now visible to the public. Despite these alterations, the exterior of the building is well-preserved and it remains a highly notable example of bank design from this era designed by the Northwest’s premier designer of bank buildings, A.E. Doyle. Prominently located on a sloping site at the SE corner of Second Avenue and Columbia Street, this two-story building was designed to serve as a bank and is now used for commercial office purposes. It measures 120’ x 108’ and includes a reinforced concrete basement. It exhibits an enframed block façade composition and incorporates highly distinctive architectural details and features using Roman-inspired motifs. The reinforced concrete structure is clad with a plain smooth marble and the exterior is distinguished by crisply cut rectangular window and door openings. The façade is divided horizontally between a prominent two-story base and a narrow third floor band of individually set square windows corresponding to seven structural bays. The base is accentuated by three central bays composed of ornate entry doors with large rectangular transom windows. They are flanked to each side by tall two-story windows and surmounted by an intermediate cornice. This principal façade element is enframed by tall two-story windows and a third floor level band of windows. The third floor window band and the tall base level window configuration are continued at the north (Columbia Street) elevation. The marble clad exterior exhibits a reserved use of classical motifs including carved lions’ heads, bead-and-reel moulding around the entrance door openings, egg-and-dart and acanthus leaf moulding at the header trim above the entrance doors, and a flat relief of acroteria and frieze above the terminal cornice. The large rectangular window openings hold original multi-pane divided steel sash enframed by cast-iron surrounds that rest on cast iron sills. The original recessed bronze-framed plate glass doors with bronze push bars and ornamental surrounds remain in place. The exterior remains virtually unaltered with the exception of one window bay at the north elevation that was converted to an entry vestibule. The interior of the banking hall originally included highly distinctive finishes and features. These interior spaces were significantly altered in 1969 when the building was converted to a brokerage house. A small portion of marble flooring and travertine trim are currently visible within the remodeled entry vestibule. There may be other intact or architecturally significant interior building features or finishes that are not longer open to the public.